Today's the first class of the elective in Design Leadership that I'm teaching to MBA students at the Saïd Business School (SBS) at Oxford University. This is the first such elective at the school, and one of relatively few round the world. The first wave of 'design management' teaching in business schools in the 1980s-90s such as at London Business School is now giving way to what might be seen as a second wave, with a focus on 'design leadership' and 'design thinking'. Examples are Stanford's d-school, and the new school of management and design at Zollverein in Germany. These programmes are building on earlier work by designers, design managers and academics which established the need for a better understanding of the interfaces between design and organisations. Our eight-week course at the Saïd, which 19 MBAs have signed up for, aims to equip students with an understanding of the processes, methods and practices within design disciplines; expose them to the influential theories, models, frameworks of analysis for managing design activity; help them develop a vocabulary with which to communicate ideas about design and design management both with designers and with others; and enable them to develop relevant skills to use within management contexts. Part of the activity includes a joint project with MA Design Products students from the Royal College of Art, London, working with designer and tutor Noam Toran. The design of the elective draws on my experience of leading design teams including multidisciplinary groups grappling with complex problems in which no single discipline has all the answers. The pre-class task I set the class proved very powerful. I asked the students to take photos and screenshots of two examples of good design, and two examples of bad design, at the SBS - a shared context in which the architecture, interior design, service and process design, intranet and IT services provided a rich environment for students to consider and critique. As the students presented their examples one by one, definitions of 'good' and 'bad' design emerged, which led on to a structured discussion about how designs (outcomes) are designed (process), and to what extent organizational structures and roles are equipped to facilitate good design - or to lead by design. In the second half of the class, we watched the ABC television documentary in which IDEO designers re-design the shopping trolley in five days. Extracting from this a set of design practices, the students then worked in pairs to use this process to say how they would go about re-designing some of the artefacts in the school they found were badly designed. These hands-on exercises helped students reflect on the material reality of design decisions and begin to understand the organizational issues involved in managing design practices - whether done by designers or others. For the details of the conference, see the Design Management Institute's website (link below), and see also Ralf Beuker's blog on his workshop there and the issues raised at www.design-management.de. As is typical at conferences involving both practitioners and academics, the conversations were taking place at several levels. Some people were telling stories about their practices; others were refering to or defining models and building directly on an evolving and transferable body of knowledge. As a relative newcomer to this conversation with a practitioner background, I was glad to have an opportunity to hear different positions articulated and to meet some interesting, thoughtful people. As I understood it, the conference was trying to mark out different models of design leadership and their implications, within the terms of reference of the organizing body, the DMI, whose vision is to "improve organizations worldwide through the effective management of design for economic growth". - The desire of designers to be taken more seriously/have their value understood/have a seat on the board; or the claim that this is already so (design as function; the strategic role of design). - The question of how to export to other domains designers' approaches, practices, methods and tools (often characterized as 'design thinking' - potentially a kind of design leadership). - The question of whether designers want to own 'creativity' within organizations. If managers and entrepreneurs work in reflexive, iterative, conceptual, creative ways, and make use of design thinking where relevant, does this need to be labelled 'design leadership' or could it just be 'leadership'? - The problems created by the language of some designers, and by much of design education, which serves to keep non-designers out. - The argument that people involved in design management (practitioners in design and client organizaions, and academics researching and teaching in this area) are mostly talking to themselves; that management and change management consultants, for example, are already adopting some of the practices of designers (but not calling it design) and may step up to the challenge of further disseminating them before designers and design educators do. - Acknowledgement of emerging areas of design within organizational contexts in particular service design, interaction design and experience design. The services sector now accounts for 70% of many advanced industrial economies (UNCTAD, 2004, World Investment Report: The Shift Towards Services). But the conference emphasis was on branding, communications and product design which are, more or less, solved problems and certainly well-framed problems. - Greater acknowledgement of non-corporate contexts for design including the public sector and the growing area of social entrepreneurship, covered for example through a detailed case study presentation, rather than mentioned only within the context of one academic paper. See for example the research work of the UK Design Council's RED unit, and the Skoll Centre for Social Entrepreneurship, part of the institution where I work. - A deeper discussion about the limits to design leadership. 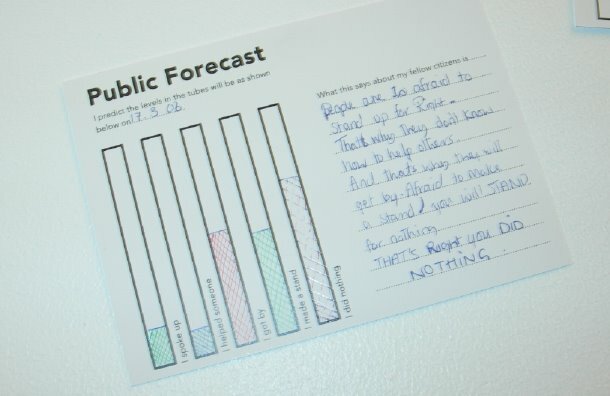 Could design leadership create an effective response to a disaster or emergency? Could it lead to a coherent policy within Europe on handling asylum seekers? Could design leadership, rather than other kinds of leadership, lead to sustainable innovation in the involvement of citizens in democratic processes? Clearly some of these issues challenge the DMI's vision of using design management to improve economic growth but a case could be made for their inclusion, or at least their consideration, within this framework. The badges in the five tubes in the public library were all gone within two weeks: that's approximately 7,500 badges distributed unevenly and anonymously on coats, jackets, bags, and the pavements of Kennington, south London. 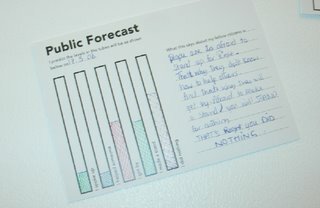 The library staff said that lots of children had taken them and seemed apologetic about this: in their view, they weren't taking the project seriously. But a man in the library, overhearing this conversation, mentioned that all the children at his kids' school were wearing the badges and that they had raised discussion there. 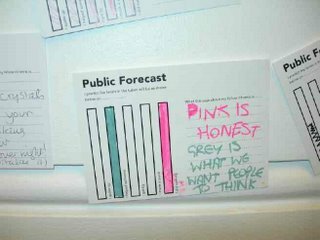 On the wall opposite the now empty tubes I saw some filled in 'public forecast' cards I designed, asking people to predict the levels of badges in the tubes on a particular date, with comments. The two shown here suggest a disappointment about people's engagement with the social. 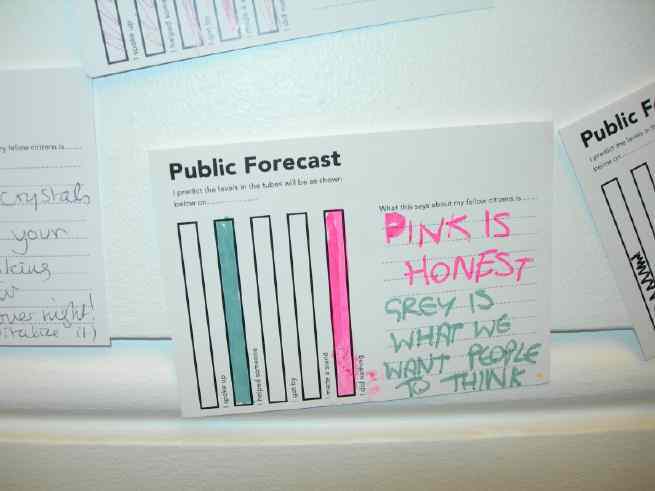 "Pink is honest, grey is what we want people think," writes one person. The pink badges say "I did nothing" while the grey ones say "I helped someone". The other card says "People are to (sic) afraid to stand up for Right." I don't yet have pictures of the levels of the tubes changing day by day as people took the badges. The curator Ellie Harrison has arranged for another set of badges to be installed, and asked for a daily photo documenting the changing levels. Reviews: The exhibition is featured in the April 2006 issue of Art Monthly and is also mentioned on the Information Aesthetics website.